Mastering LEADERSHIP involves developing the effectiveness of leaders—individually and collectively—and turning that leadership into a competitive advantage. 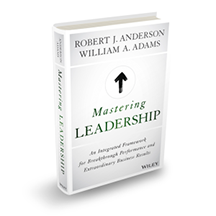 This comprehensive book serves as a roadmap for those seeking to discover optimal leadership. According to industry experts, new skills and knowledge have a 79% higher probability of retention when reinforced by collective development and coaching, therefore enhancing the sustainability of your investment. A thoughtful and integrated approach to advance your success begins now. Higher Ground is a leadership effectiveness and executive coaching consultancy focused on the delivery of an integrated framework for leadership skills training, development, and learning that is designed to elevate individual and team performance for extraordinary business results – through improvements in effectiveness and productivity. Our work is focused on skills and competency training, assessment, group facilitation, and individual / team coaching services and includes evaluation for the purpose of focus, opportunity identification, success measures and the monitoring of change improvements over time. Our clients experience notable improvements in performance, productivity, engagement, employee retention, and stakeholder satisfaction, as a result.